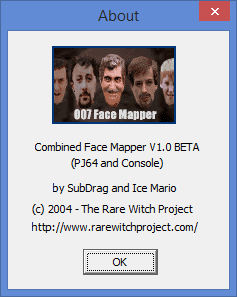 This is a beta version of the Perfect Dark and Goldeneye console and emulator face mapper. It will work with either Goldeneye or Perfect Dark Save States from Project 64, or console version of Goldeneye and Perfect Dark (if no exp pak mode). Perfect Dark's console feature must be used with the GS/AR code generator on, and the enable code EE000000 0000 to disable the code generator. Goldeneye's simply requires the code generator to be on. The GS/AR is then connected through the parallel port cable to the pc, and the face mapping program run. SPECIAL NOTE - PLEASE READ: The console version is designed for Windows 98. Through some glitch with XP and the parallel port, it is likely that it will hang in XP. You can try adjusting the Sleep setting in the ini file to different millisecond amounts (400 should be first try), but it is quite possible it will not work in XP for you. Windows 98 has full compatibility though. NOTE: You CAN modify the outfits of the Joanna Dark model and sims in no expansion pak perfect dark. Digits are available upon request, 0199 is Connery suit, and 01A1 a valid head, for example.